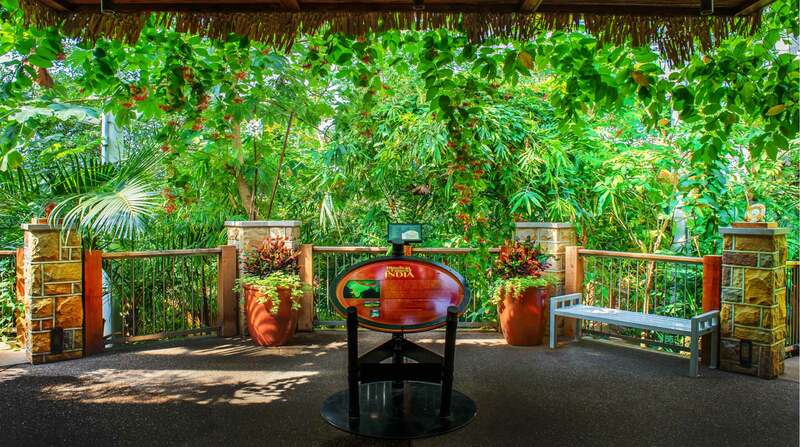 Celebrated as the most energy-efficient structure of its kind when it opened in 2006, the impressive 60-foot-high, 12,000-square-foot Tropical Forest Conservatory takes visitors from Pittsburgh and beyond on a colorful and inspiring journey through some of the most botanically rich regions of the world. 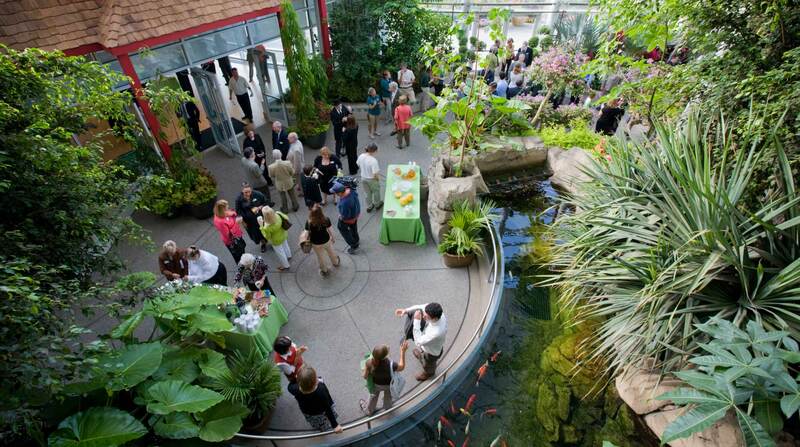 Incorporating impactful ethnobotanic displays, cascading waterfalls and lush greenery, this state-of-the-art facility was intended to raise the bar for glasshouse design and construction, further proving how favoring a fresh approach over past conventions can provide solutions to nearly any sustainability challenge — in this case, eliminating many of the high costs associated with heating and cooling. In sharp contrast to our 1893 glasshouse, which was designed with the prevailing technology of the time and relied upon limited passive ventilation systems that poorly regulate interior temperature, the resultant Tropical Forest Conservatory quickly revealed the fruits of its unconventional design, using 40 percent less energy than traditional glasshouses as it maintains more consistent temperatures all year round; in fact, there is no greenhouse effect at all in this structure, it is always cooler inside than out in the summer, and it uses practically no electricity — thanks to its unique shape and a number of other energy-saving strategies. Today, 100 percent of the building’s energy needs, as well as those of the rest of the Phipps campus, are met with solar power and wind energy generated both on- and off site. 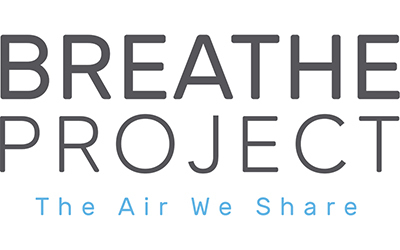 Click the sections below for additional details on project features and more. 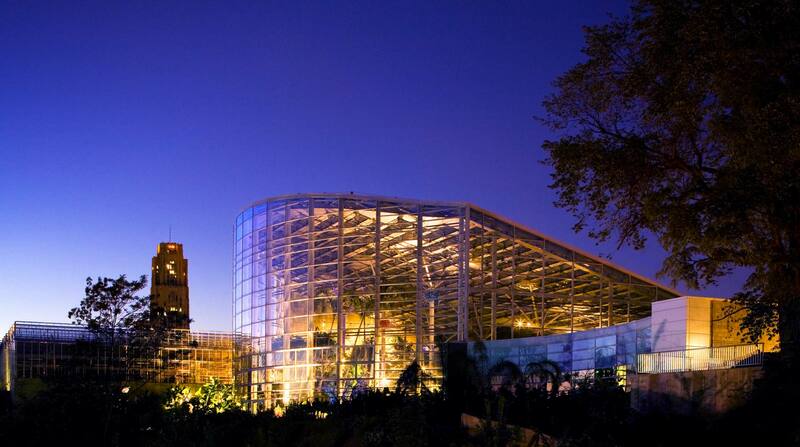 Unlike traditional glasshouses, the Tropical Forest Conservatory features a high south wall and a roof that slopes downwards from south to north, allowing for the use of energy-saving double-pane insulated glass on the roof, while still maintaining proper light levels for growing plants. Using the results of a tracking study that monitored the path the sun takes across the sky on winter days, our engineers designed the south-facing wall to be at an optimal height, ensuring that 100 percent of the winter sun permeates the conservatory interior. 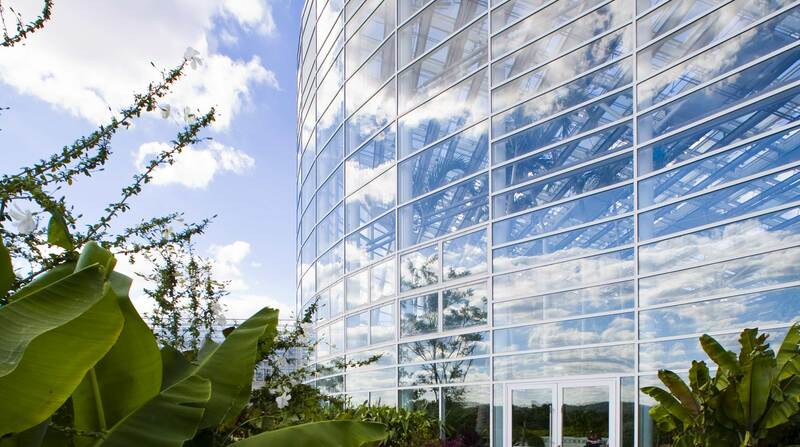 This wall contains single-pane glass, enabling the full spectrum of light that plants require to enter the structure. 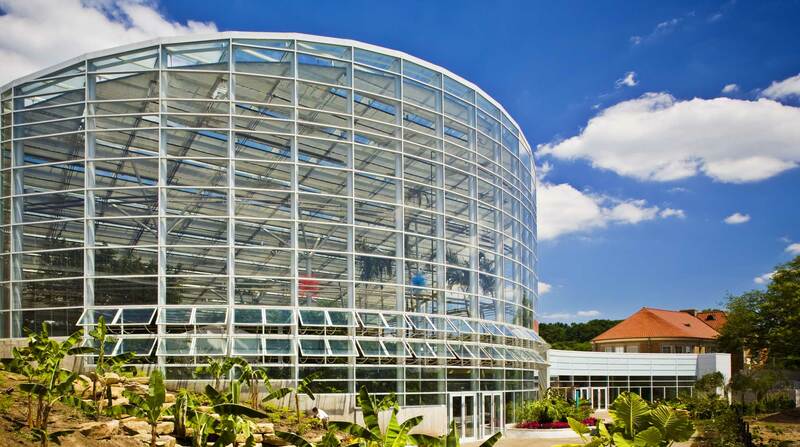 Since the roof is sloped, the sun never passes through it in winter, making it possible to install energy-saving double-pane glass that could otherwise not be used in a greenhouse due to its ability to block light and solar radiation. In cold weather, this type of glass maximizes heat gain and limits the escape of warm air through the roof. In the summer, solar heat gain is minimized. 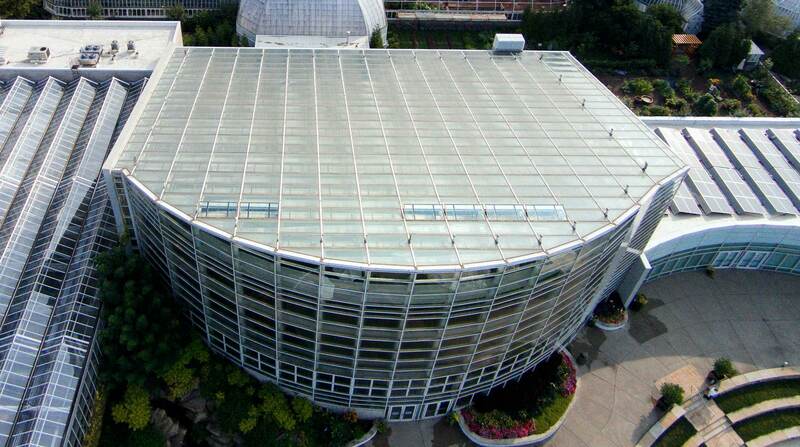 Further contributing to the effectiveness of the design, the Tropical Forest Conservatory also boasts a revolutionary open-roof system that facilitates the release of hot air, virtually eliminating the greenhouse effect and the need for costly exhaust fans often employed in traditional conservatories to manage heat build-up. These vents are controlled by an Argus computer system, which opens and closes them based upon internal and external conditions. 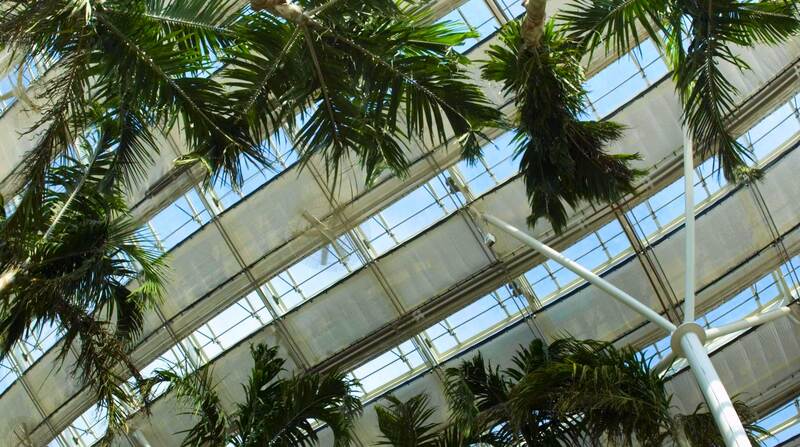 Enhancing the efficiency of the Tropical Forest Conservatory even more are a number of energy blankets and shade cloths on the roof that provide shade in the summer and thermal insulation in the winter. Like the roof vents, these are controlled by the intelligent Argus Control System. Western and northern walls made from concrete are insulated on the outside to achieve thermal mass, collecting heat during the day and releasing it at night as temperatures fall. A root zone heating system installed in the plant beds consists of a series of underground tubes that use hot water to deliver radiant heat directly to the roots of plants, effectively promoting their growth and allowing Phipps to save energy by lowering ambient air temperature. 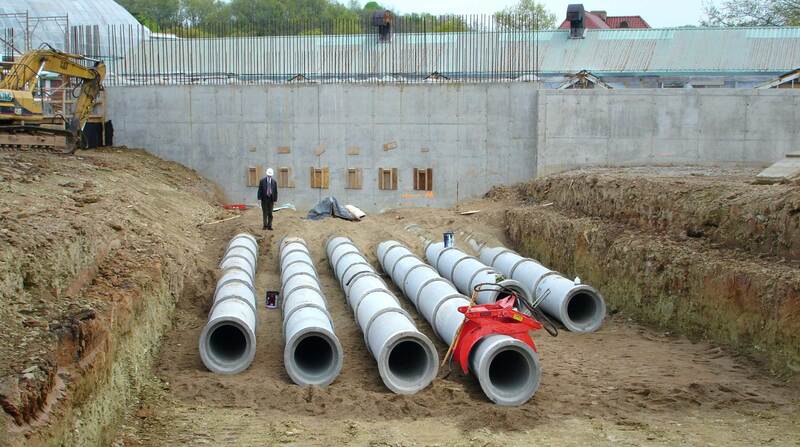 Six 24-inch-diameter, 300-foot-long concrete earth tubes buried 15 feet below ground, where the temperature remains constant at 55 degrees, also help to eliminate the need for mechanical cooling. When the vents are open, a vacuum suction is created by hot air exiting the roof. The earth tubes then pull fresh air in from the outside, effectively cooling it as it passes through. While no longer on site, a solid oxide fuel cell prototype created by Siemens Power Generation to convert natural gas into electricity was the first to ever be used in a public garden. Energy-saving double-pane roof glass insulates while maintaining proper light levels for growing plants. 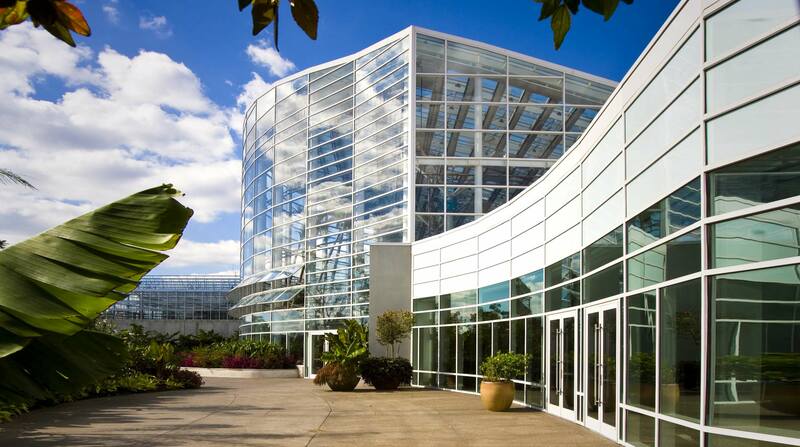 Special Events Hall adjacent to the Conservatory features the first commercial installation of Solarban 70 XL solar control low-emissivity glass, the most energy-efficient glass available at the time, designed and manufactured by PPG Industries, Inc.
Half of the 12,000 sf roof opens to eliminate the "greenhouse effect"